Naruto Manga Chapter 501 The Nine-Tails Strikes is already out. In this chapter still tell us about naruto's born in flashback. 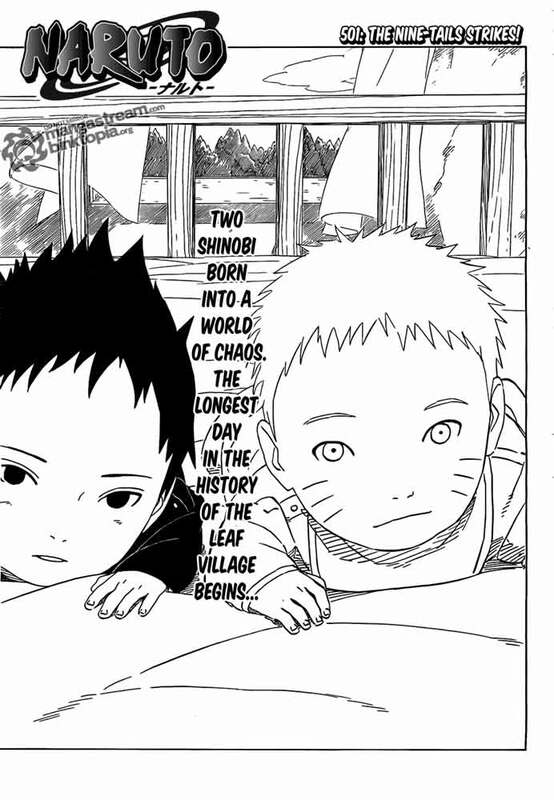 Starting with Two shinobi born into a world of chaos, they were Naruto and sasuke. The longest day in the history of the leaf village begins. In the day Naruto's born, he ws kidnaped by Madara in order to revival the nine tailed fox. Madara forced Minato to use his flying thunder god technique to separate him from Kushina. Not only that, Madara succesfully awakened the nine tailed fox and controled it by Sharingan. Before they head for the hidden village, Minato came on the right time when Kushina life was in danger. By using teleportation technique, Minato take Kushina to Naruto's side. And here begins the first act of the horrible tale of that day.